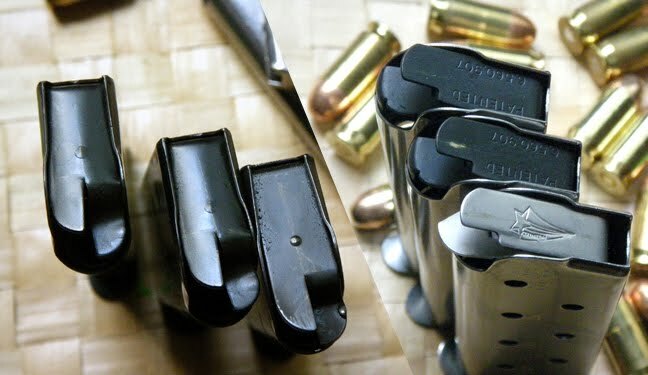 I have been advised in Comments of the need to take more than one or two magazines to my 1-day Defensive Handgun Safety and Manipulation course (with the esteemed Louis Awerbuck) so as not to be constantly off-focus and re-loading, and miss what is being taught. 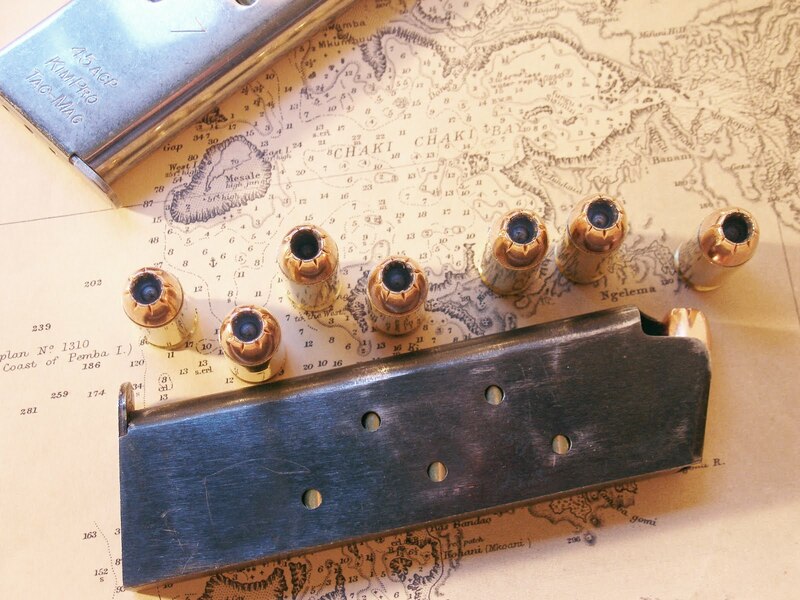 So, on the sage advice of the Goddess of Gunology, (primary among others) and in an effort to NOT be That Guy (who I so often-are) magazines are wear items, and I have been planning and preparing in advance. Today reading ToddG‘s brief on human potential, The Wrong Gun, he discusses the emotional attachment that people develop to the choices they made/make – a kind of false-conscioussness of gunnery that is common and evident among Teh Gun-Culture, and then seek to justify it. 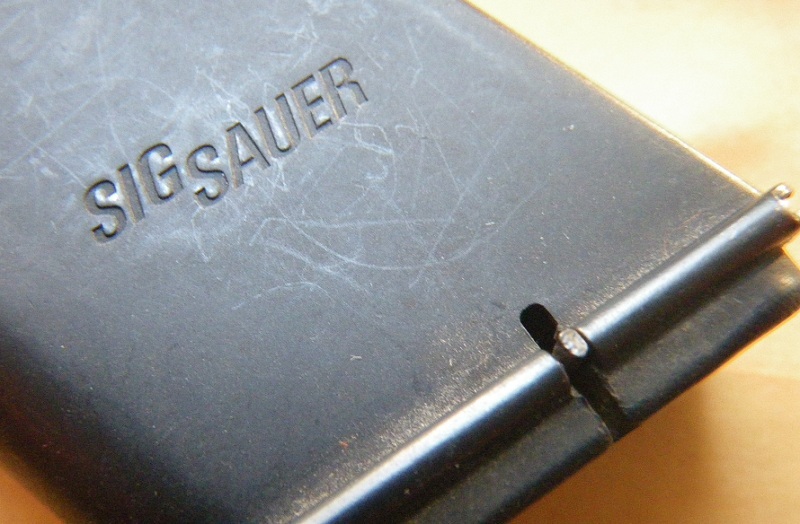 My friend Uncle came across an old Sig magazine in a dark corner from his Gun-snoot dayze, and currently lacking the base launcher while knowing I did not, sent it to me for a very Merry Christmas! Quel Surprise! And it happens to be an interesting old(er) magazine in the eponymous caliber beginning with a proverbial 4 and ending with a 5. And anybody who reads this blog knows, I have a thing for magazines and magazine-y stuff. Haven’t been feeling many probulations for the Bloggnostications and my colon test came back A+ #1 fine without any bending-over or digital inspection necessary – but then this came today. 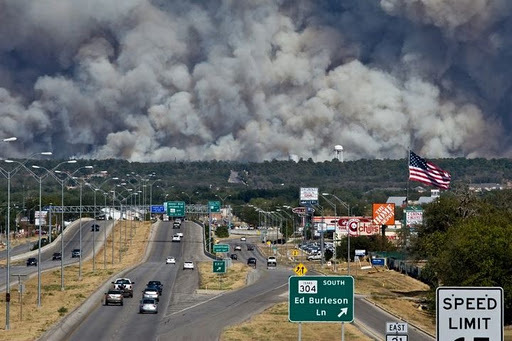 Thanks to Gun Geek Rants and No Lawyers – Only Guns and Money I was alerted to the disaster that had struck Texas and one of our/my favorites in particular. This fire destroyed at least 1,500 homes, most of Bastrop State Park, and resulted in 2 fatalities. One of the houses that burned belonged to Virgil & Shari Tripp of Tripp research and STI fame. Their shop survived but the house is gone. Tripp Research is Teh Awesomz! 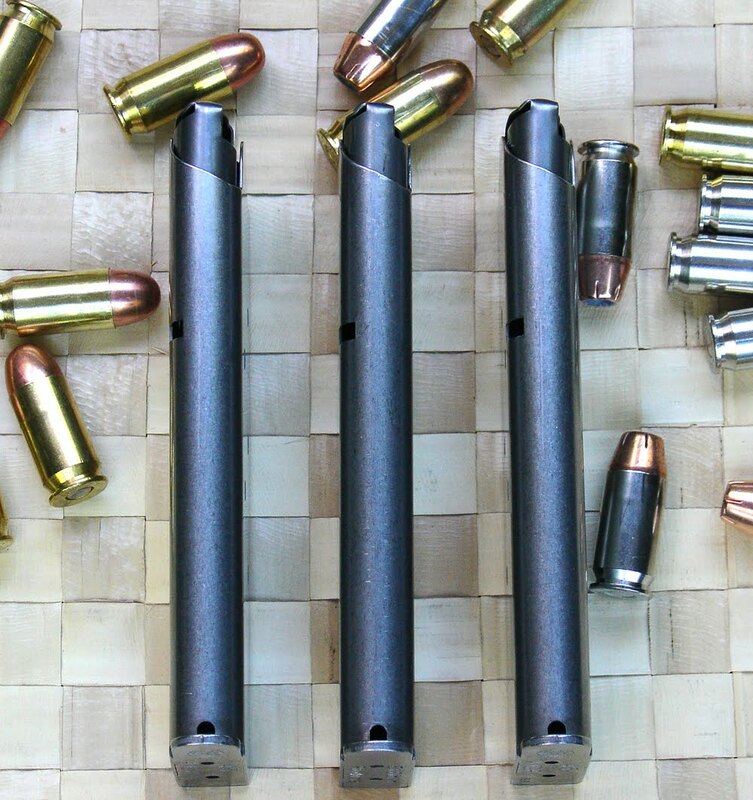 Go get yourself some of their gunny-love and superior-cycling magazines – and anything else to keep ’em afloat… Ok “Our Favorites” is bigger than I intended to suggest, since I’m a small-fry, but it provided an excellent excuse to buy a bulletproof 1911 mag! 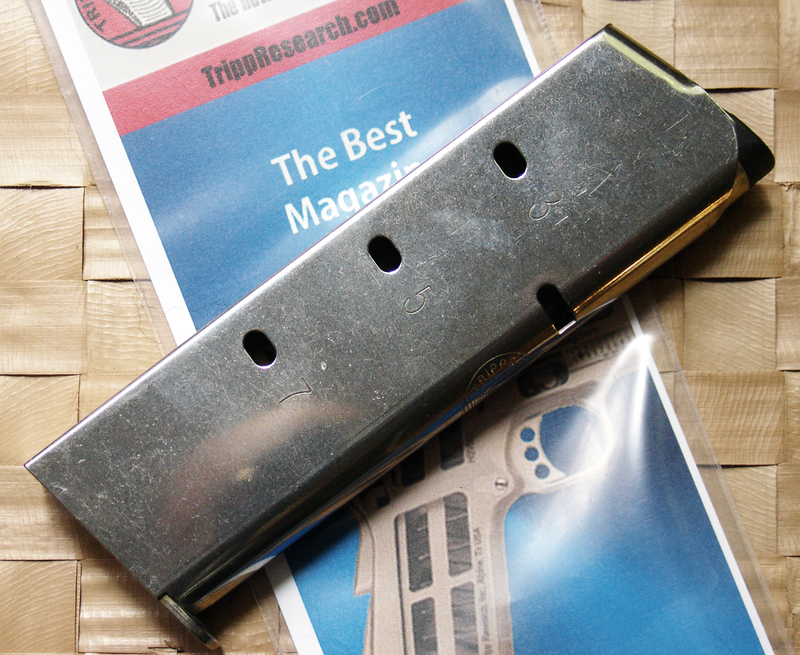 It’s the 21st Century and now I have a thoroughly modern magazine for the 1943 Colt 1911A1. I am rather looking forward to running this bad boy. Seven actually, there’s one in the ’43. The Brown Truck of Happiness made a delivery, and my magazine stand is full-er. 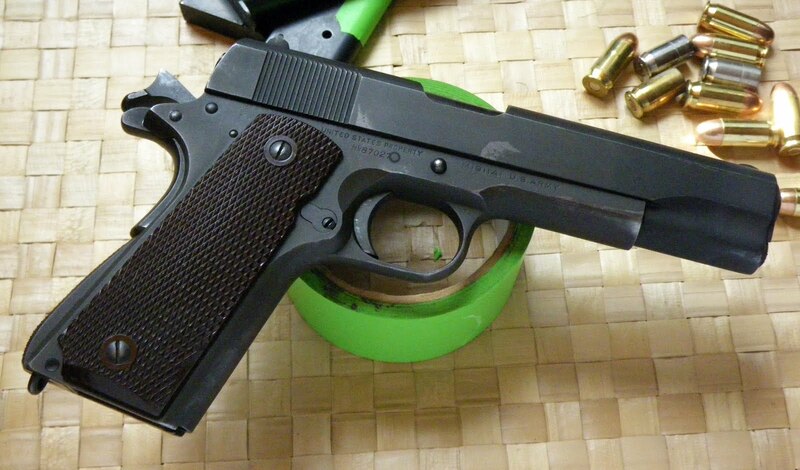 I’ve heard some negative stuff about Kimber 1911 quality control lately, but I kinda really-really hope it doesn’t extend to the magazines. 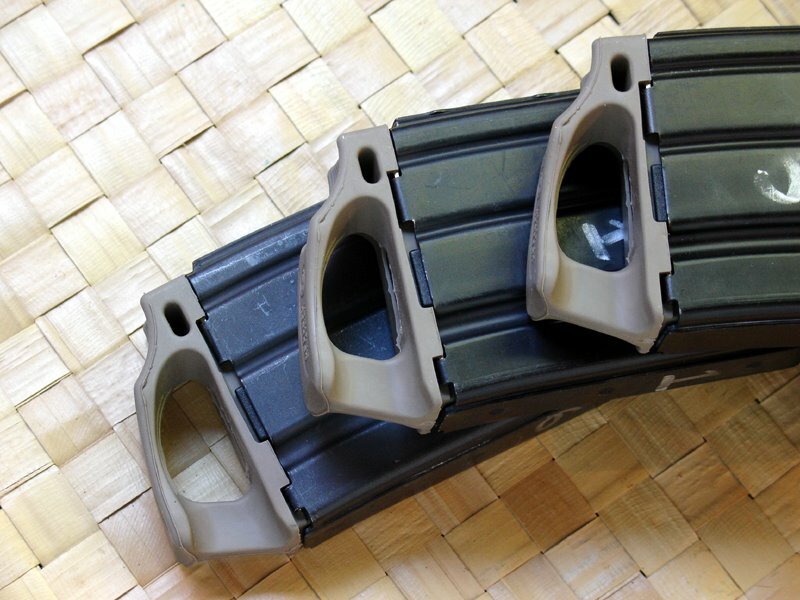 These are hella stout – and if I get another 1911 later with a funnel for a magazine chute, I can always put the humongous base-pads on them. 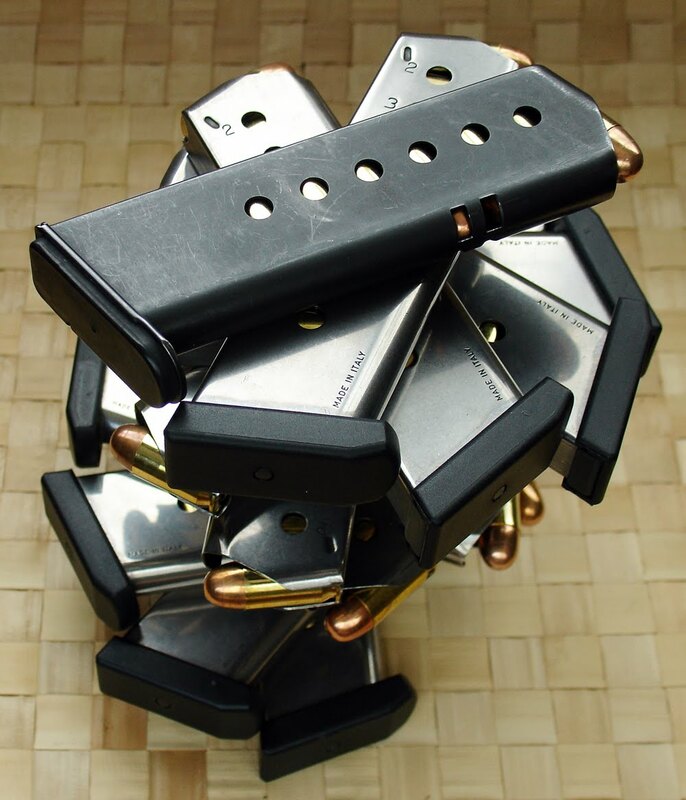 These are the Kim-Pro TacMags – 7-rounder like His Excellency JMB indicated and designed-for, and which fit the old ’43 best. Fully loaded 8-round mags, even the ChipMcCormick, are hard(er) to seat and drag noticeably on the slide – at least I noticed it, so I’m just living with it as-is. 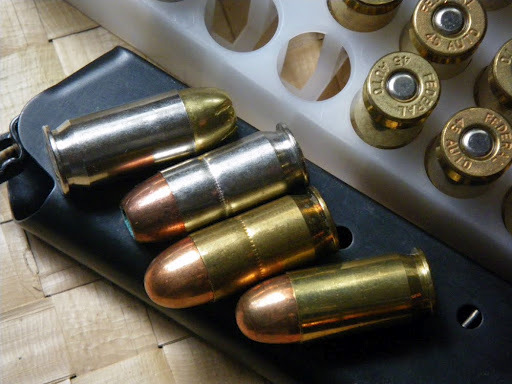 I popped over to the indoor range for a quick function test of the old Colt with Winchester white-box 230-grain JHP’s in the new-old barrel and came back 64 rounds lighter. While the hardball punched ragged holes, these neatly dissected circles in the paper. Not that I had much to do with it since I’d forgotten to bring the glasses that help me to see the front sight in focus. I again found that I could get a sight picture with my head tilted back, but I’m sure I looked a complete spazz. 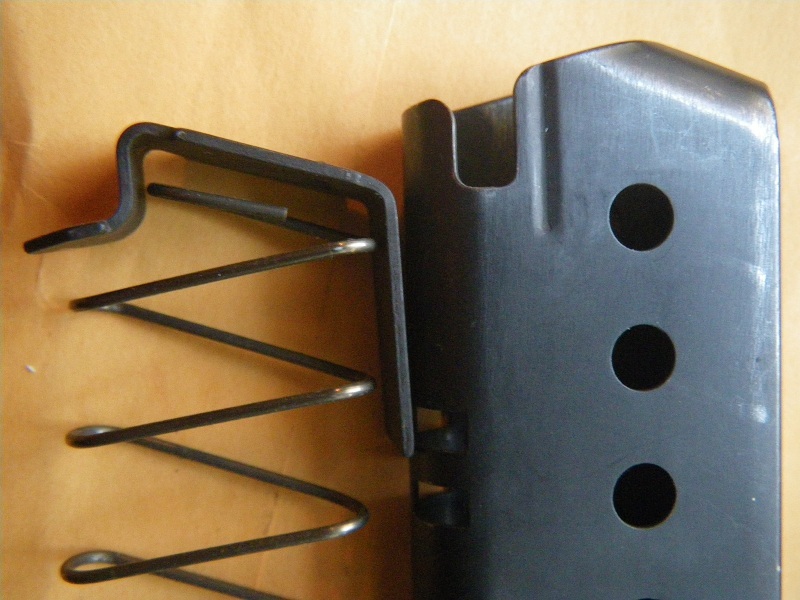 I also ran four magazines of CCI mini-mag (40 rounds) through the Sig P220 with the .22 conversion upper. 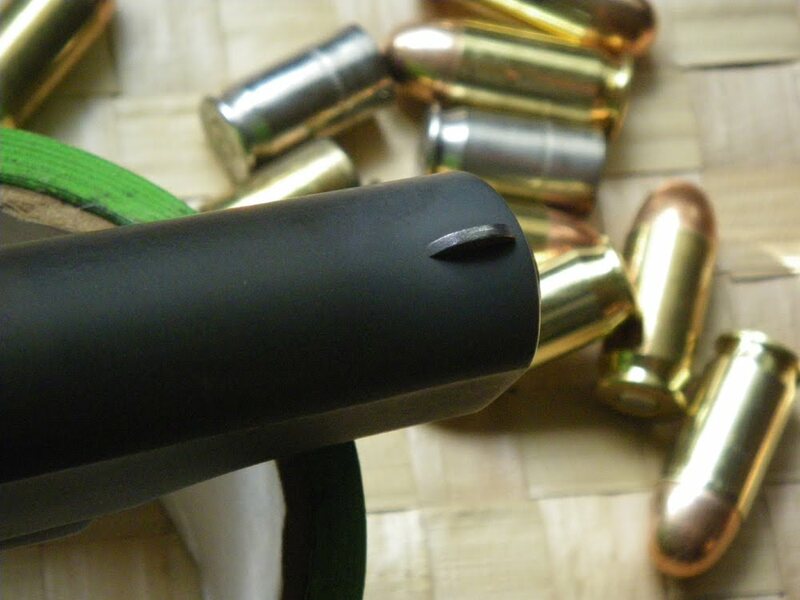 There were about six failures-to-feed where/when the little pellets just didn’t get all the way up off the stick and into battery – so about twice a magazine. 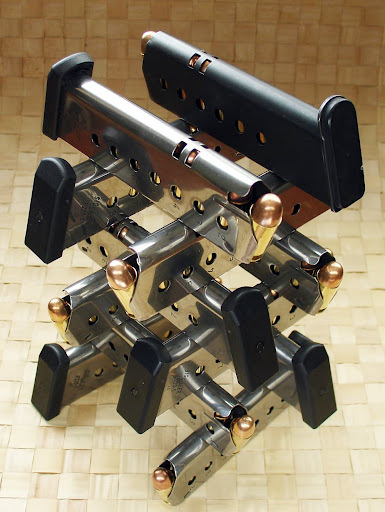 It keeps you busy doing slide-racks and safety checks, but the rest of the equation was a lot of holes in the 9 and 10-ring as you’d expect from a Sig. 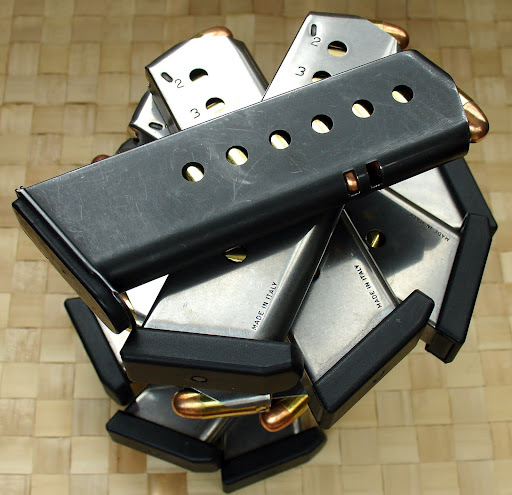 Midway delivered my latest magazine order; a Chip McCormick 8-round stainless-steel, a Gen-u-wine Colt 7-round blue, and another Kimber Kimpro 7-round TacMag – and now it’s time to gather up the assortment and do some testing. Right away some differences are noted, the old-school split follower design and the modern “improved” (or whatever they call it). 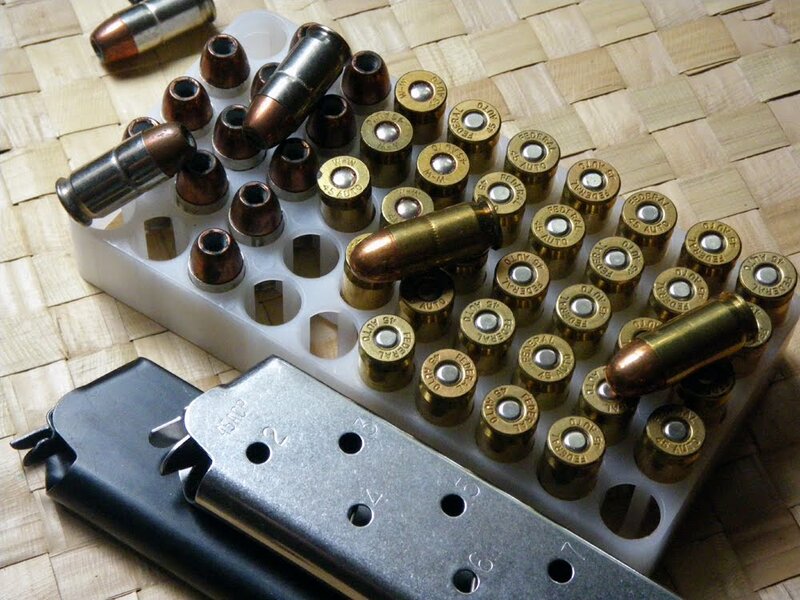 Magazines need cartridges so I dug around and came up with a bunch of the “bullet-blight” rounds from Reno – the White-box stuff that had crusty-rusty fungal growth, and from somewhere-I-don’t-know-what an OLD mixed box with some Remington-Peters 125-grain hollow-points, and other old ball ammo. 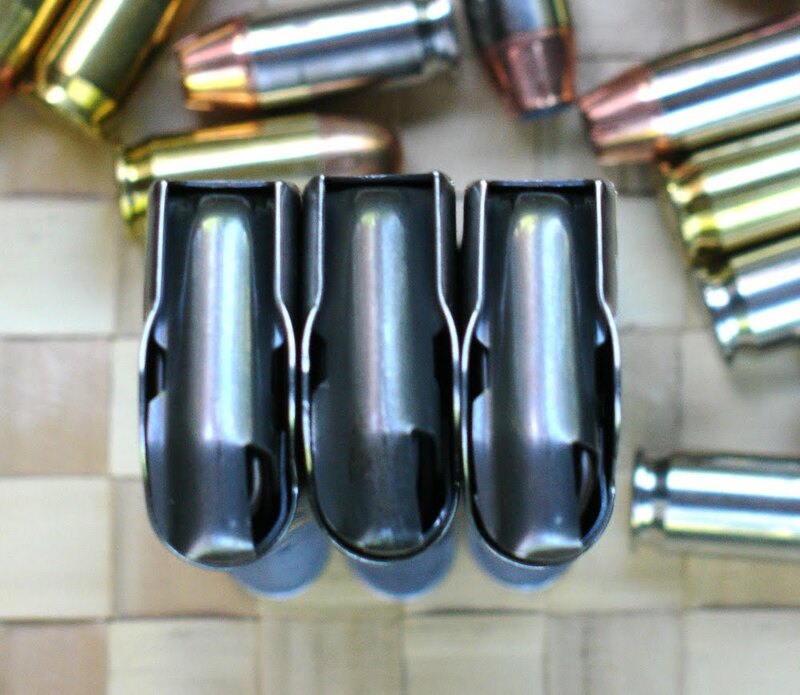 Some of the ammo appeared to be crimped in the middle, and the hollow-points I expected would serve as tap-rack-bang clearance drill material – the old gun was designed only to shoot 230-grain FMJ ball and I figured the nickle plated hollow-points would impede function. 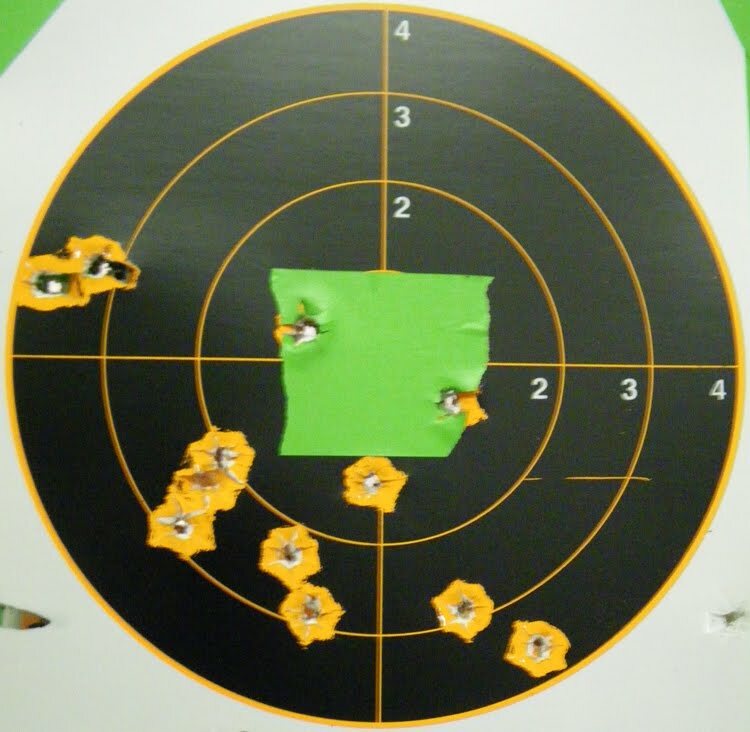 After shooting some pics I gathered it all up with my ear-protection and proceeded to Reed’s Indoor range, not my favorite place because I like shooting outdoors better – but Louis Awerbuck teaches there so it can’t be all bad. I also brought along the Sig P220 for comparison purposes. 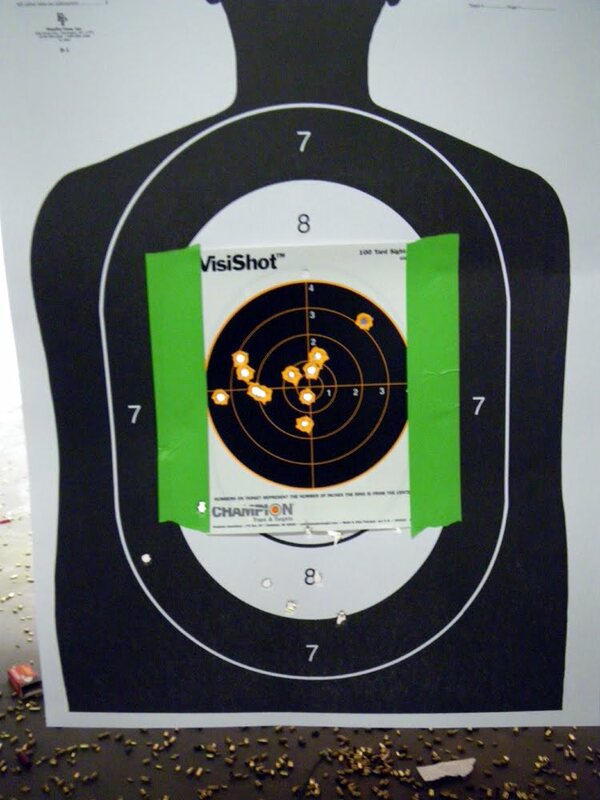 At the lane I hung up a big old target and loaded some magazines. 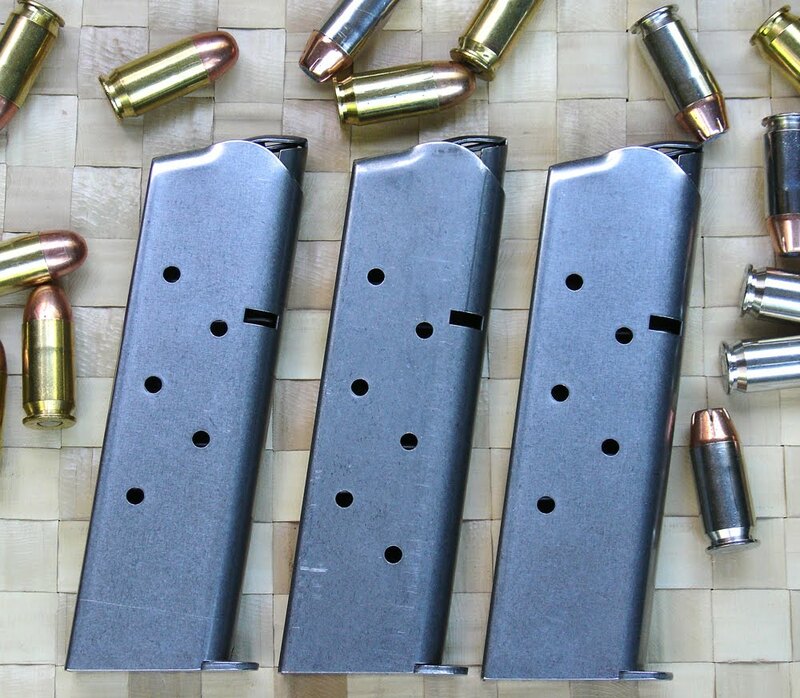 Actually I asked a neighbor-shooter to load a magazine for me, mixing up the hollow-points with the old and crusty ball-ammo to see what surprise was in store. 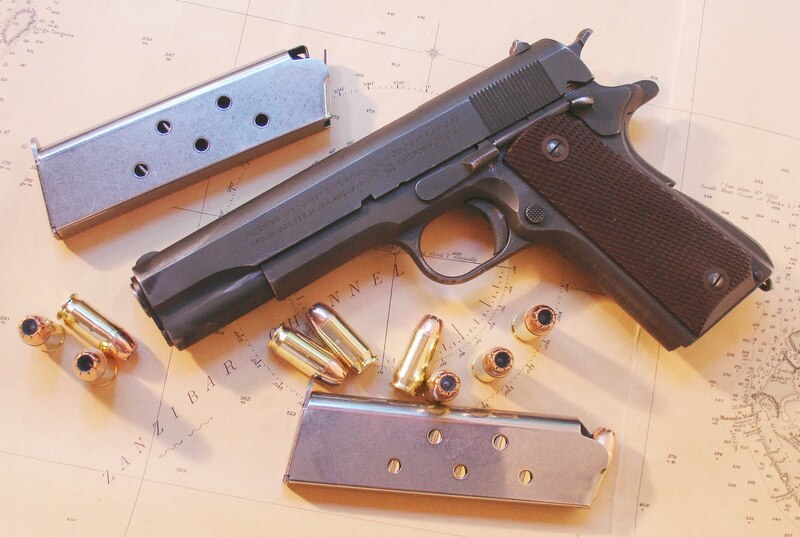 Surprise-surprise – no malfunctions with the old HP bullets in the 1943 1911A1. In fact it readily digested them, spat fire and made holes. Hmmm. 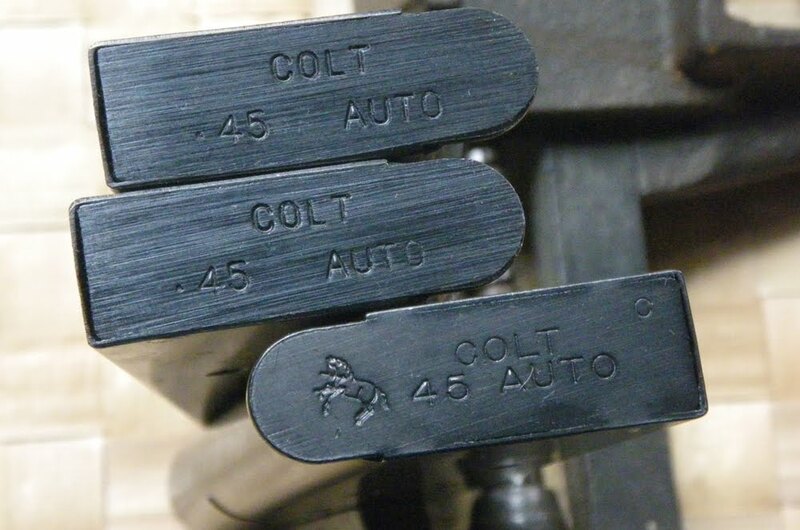 So I decided to try and find the Colt’s link – the reset click-point where the trigger is immediately good-to-go again. 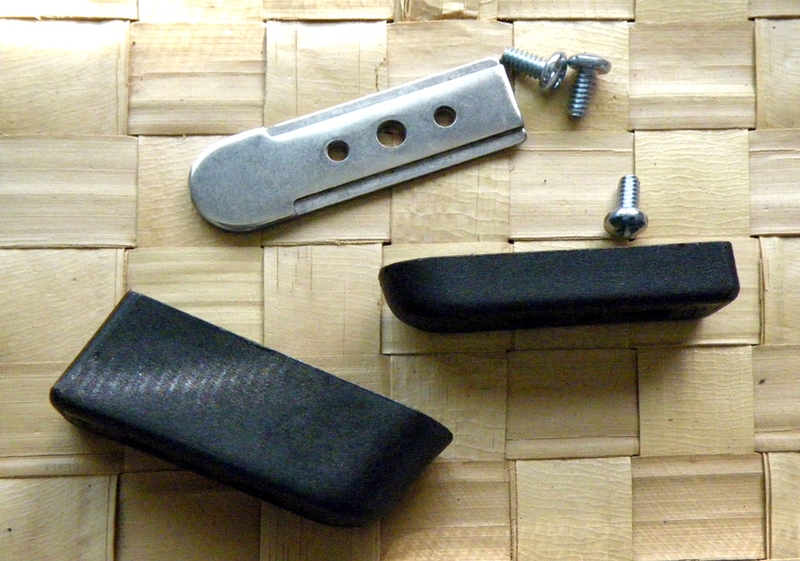 I had found it on the Sig but the ergonomics were quite different (more on that). Wow! 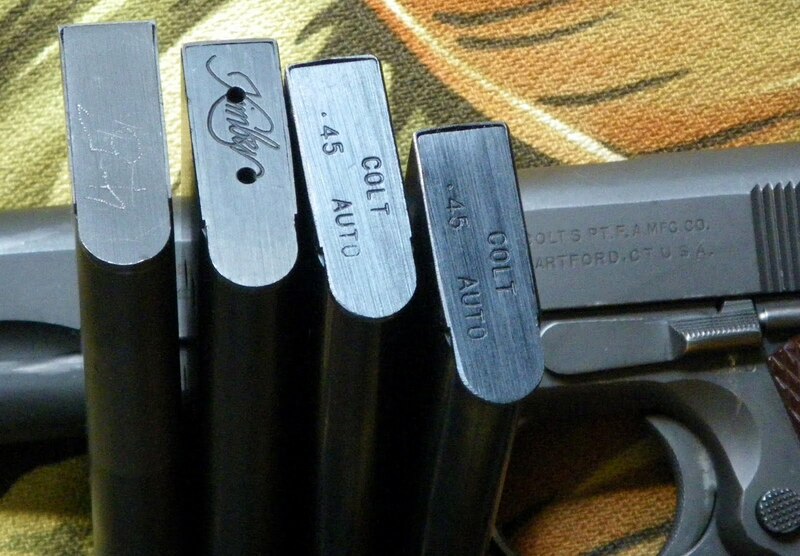 The Colt’s re-set is a very-very short release compared to the Sig. So I started blasting, trying to find (and hold) the link, trying to shoot with the thumbs forward, trying to find the right place to put my finger on the trigger – and getting the gun dirty. After a few magazines and a bunch of holes no malfunctions were apparent. 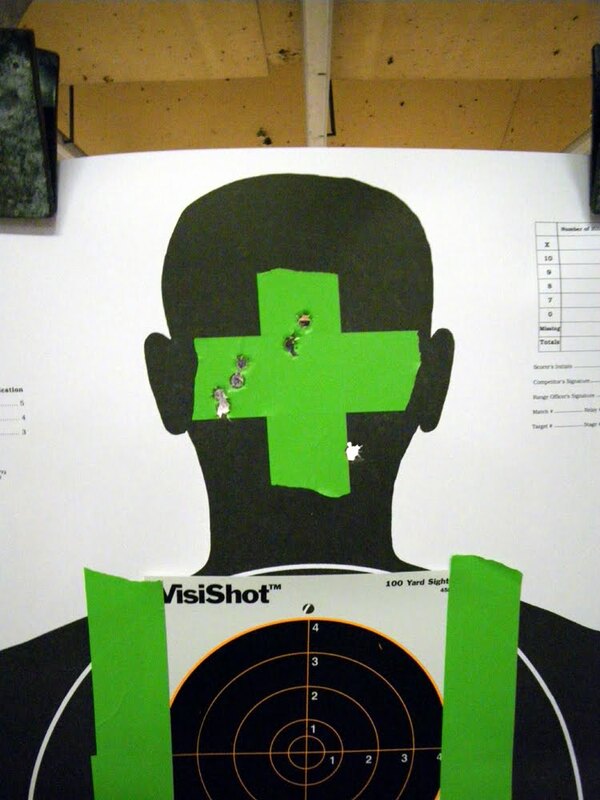 So I taped up some VisiShot targets onto my backer and loaded some more magazines. 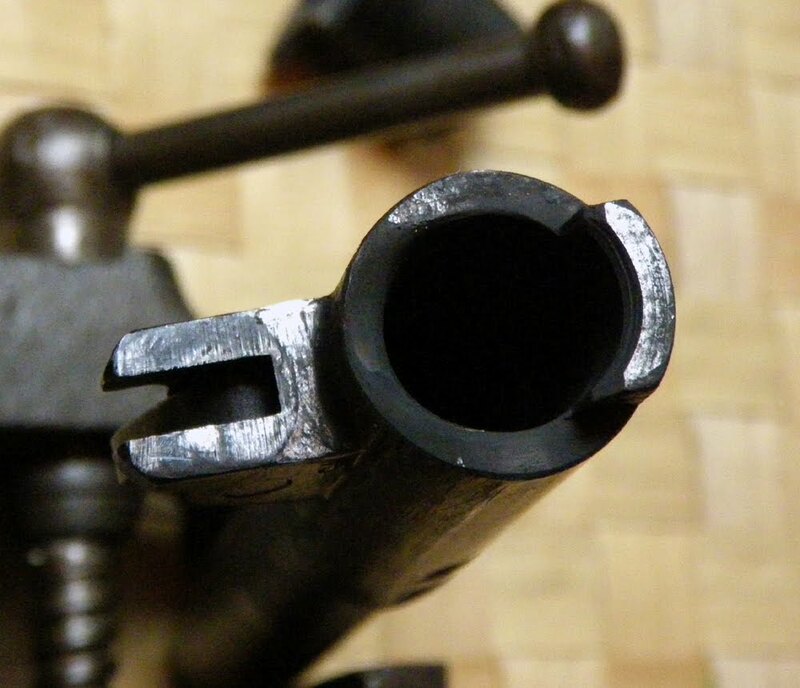 I couldn’t see the Colt’s sights – the (tiny) front sight really just disappeared against the black background. So I approximated like it was a dark hallway – some shots were better than others. 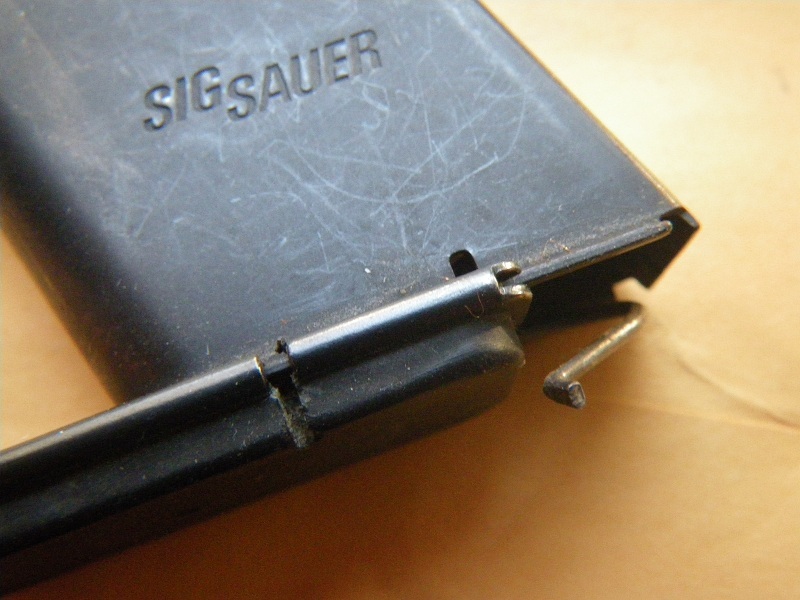 I kept emptying magazines and getting the gun dirty until I had a FTF where I had to push the slide into battery – still no stovepipes. Using the bright green tape I found somewhere I created an aiming point with a lot of contrast that would allow the front sight to stand out. 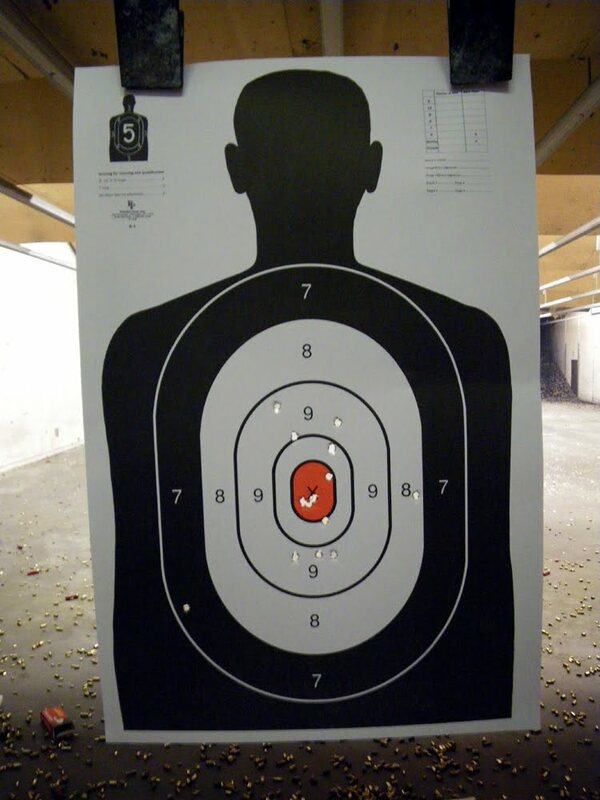 That was fun too, and after trying it out I think the gun shoots a little to the left. As always click the pics for big-sizing. 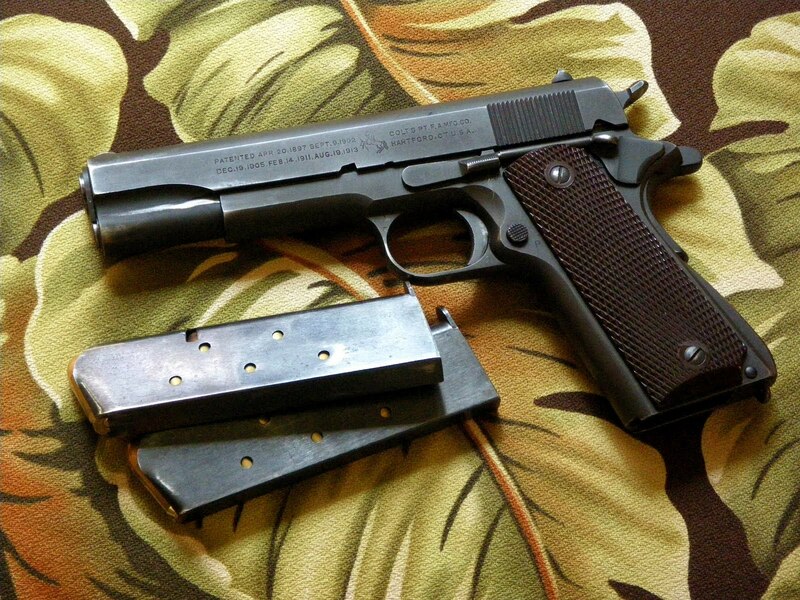 With the gun, “February’s Child” dirty I began to experience some failures-to-feed from an old parkerized magazine that had a fake WWII-style “two-tone” finish effect – and an electro-penciled “Colt .45” on the baseplate. Not a stovepipe, but a failure to go all the way into battery. I removed it from the lineup. I fully expected the Viet-Nam (?) 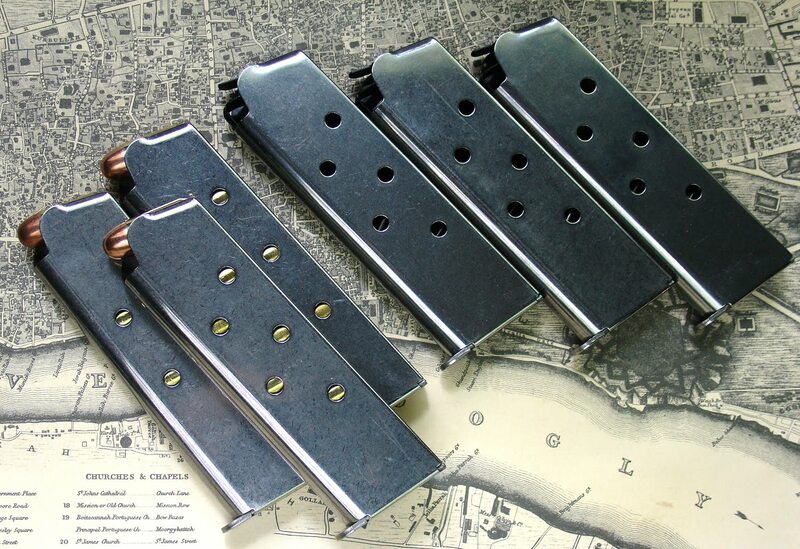 era “Colt” magazines to have a hissy-fit with the hollow-points, but none did. I’m not even sure if they are actually Colt or some clone or not – but now I’m beginning to think they might be. 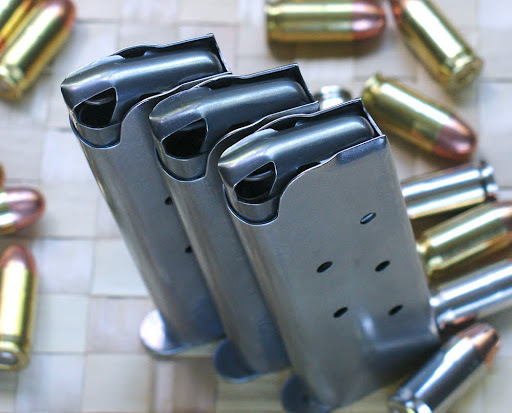 The new stainless ones ran flawlessly even with 8-rounds in them, but I had an occasional hiccup with an older Kimber magazine – one with the curvy “Kimber” lettering on the baseplate, but the gun was getting pretty dirty after around 100+ rounds. You could visibly see the front end getting sooty. So I switched to the Sig P220 for a bit in order to just have a front-sight that I could actually see. The bright green tape did help to establish contrast and when I hit off to the side the orange showed up nicely. 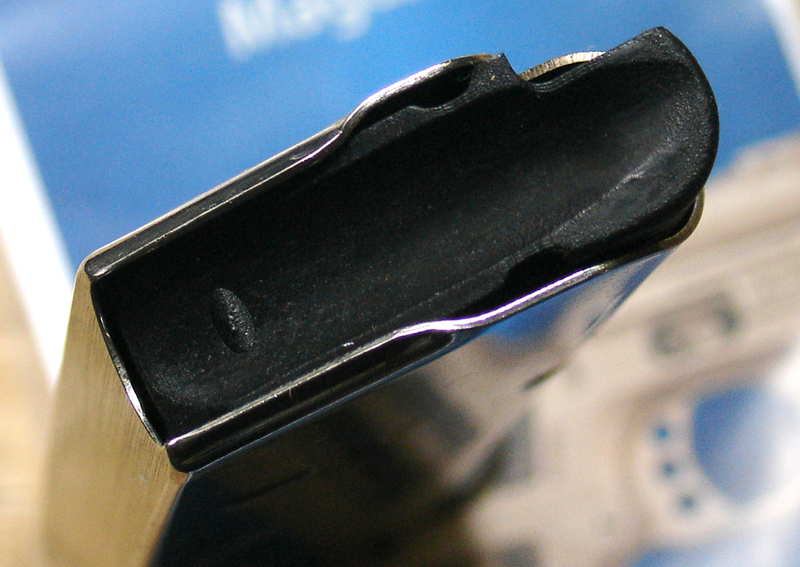 The gun continued to run even with the hollow-points while dirty, if the stainless magazines were used. I’m surprised — there’s nothing to indicate that it should digest ’em at all. And it’s dirty as all get out. 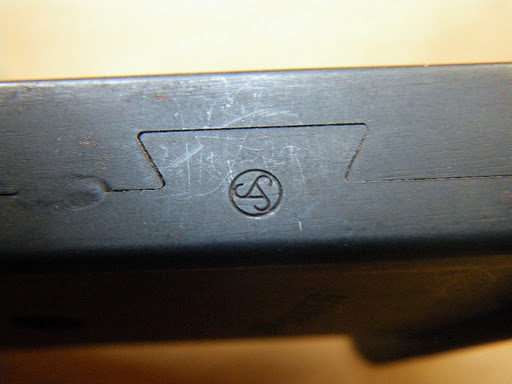 It’s a WWII High Standard barrel, a replacement unit – go figure. So over 168+ rounds later now it’s time to clean-up and re-lube. I understand you’re supposed to put some on the barrel where it rubs against the hood. As always clickez-vous ilPictorio to embigulate. 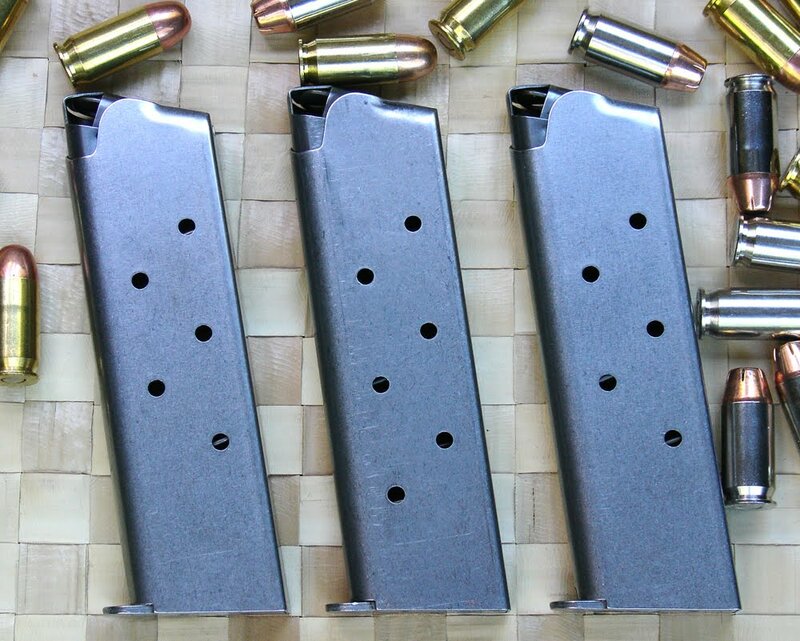 I have two perfect-working WWII USGI magazines for the ’43 Colt 1911A1 – a Scoville and Colt-Risdon, and a couple with which I’m less certain about, a good Kimber (Chip McCormick? ), and a fake two-tone stovepipe goober. Now that I’ve been on the shopping spree for the Sig I’m considering doubling up on the Colt too. 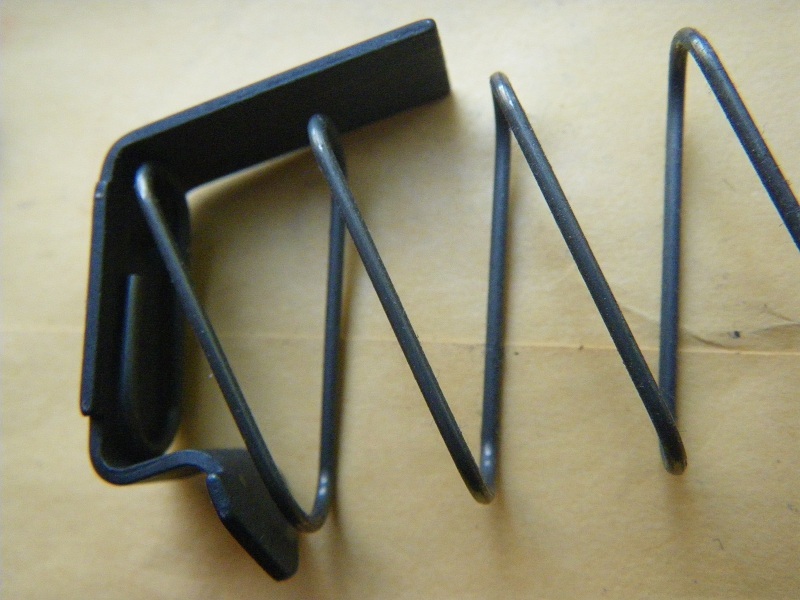 I’d like to get more WWII stuff but the prices are as collectibles now starting around $50 – way more expensive a Wilson or a MecGar or a cut-from-billet Les Baer…and I don’t know which ones to get. I’m thinking 7-rounders and no plastic base-pad, because Lew said so in a column. For a more incisive post on magazines and huge trophy-wall of collective participating opinions and comments, Tam has a post, “How Many Magazines is Enough?” that adds more value than I possibly could. Rangers. North Africa and Italy. Omaha Beach and Pointe du Hoc. The invasion of the Philippines and the Raid at Cabanatuan. Merrill’s Marauders deep in Burma. Binh Duong Province. Mogadishu. Kabul. From Algeria to central Burma in WWII, from Korea to Iraq – Rangers have sacrificed. And now to California where they sacrifice again. 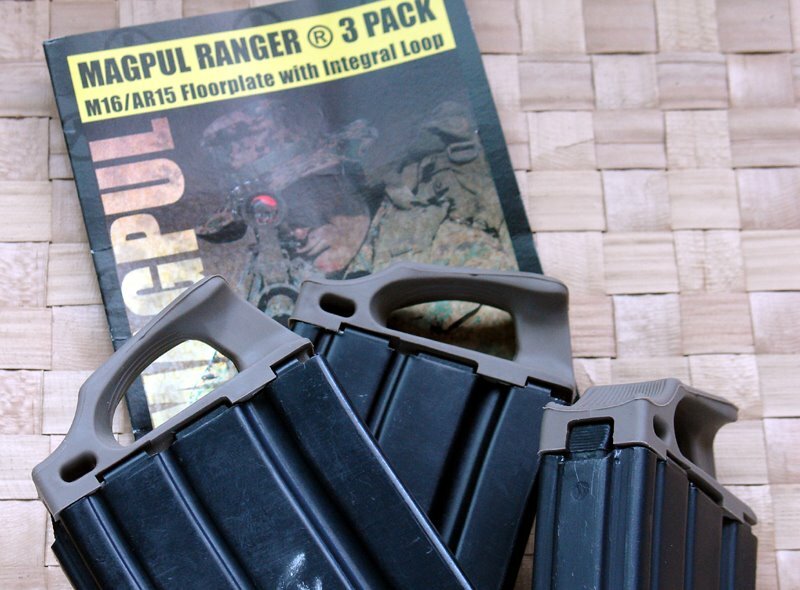 Where due to the unique and peculiar, arbitrary and repressive, spastic and fantastic, the bizzaro-world of the Legislature and other circumstances of California Gub’ Laws — magazines can only be 10-rounds – the Magpul Ranger Floor Plate sacrifices two. 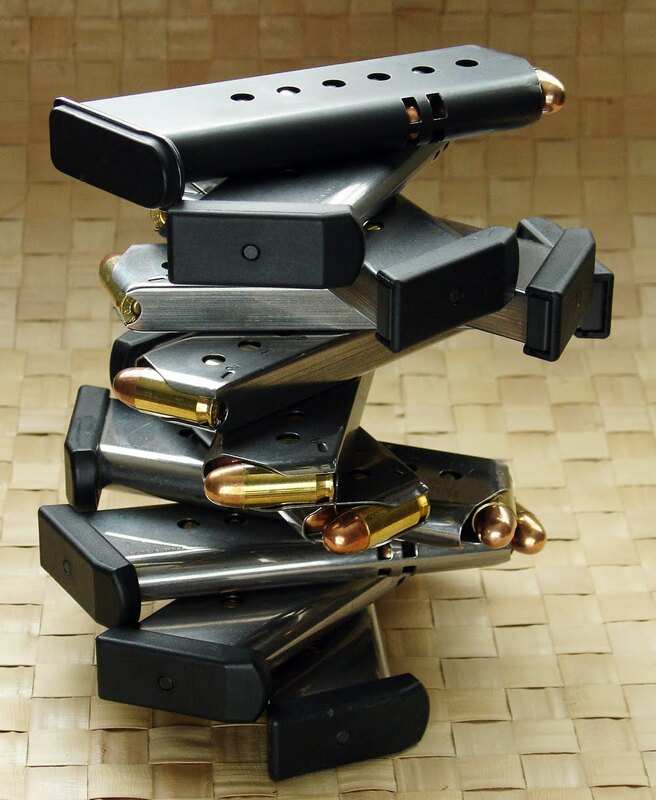 Turning 10-round magazines into 8-round magazines. As a literary ouvre it’s small, The AR as M1 Garand – but without the whomping sectional density of calibre. It is a petite M’forgerie to the bristly old battle-hardened Garande Dame. 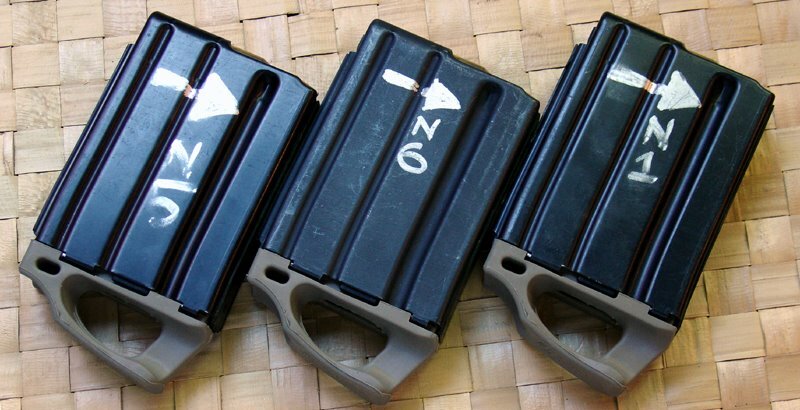 But aren’t they cute little magazines! ?